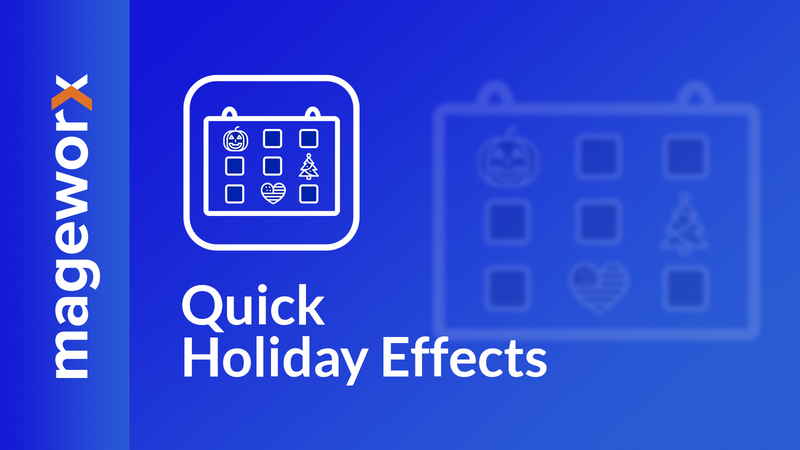 Quick Holiday Effects app allows you to quickly and easily decorate your store for any special event such as Halloween, Thanksgiving, Christmas, New Year, St.Valentine’s Day, Hanukkah, Easter, etc., and create special holiday mood for your shoppers. 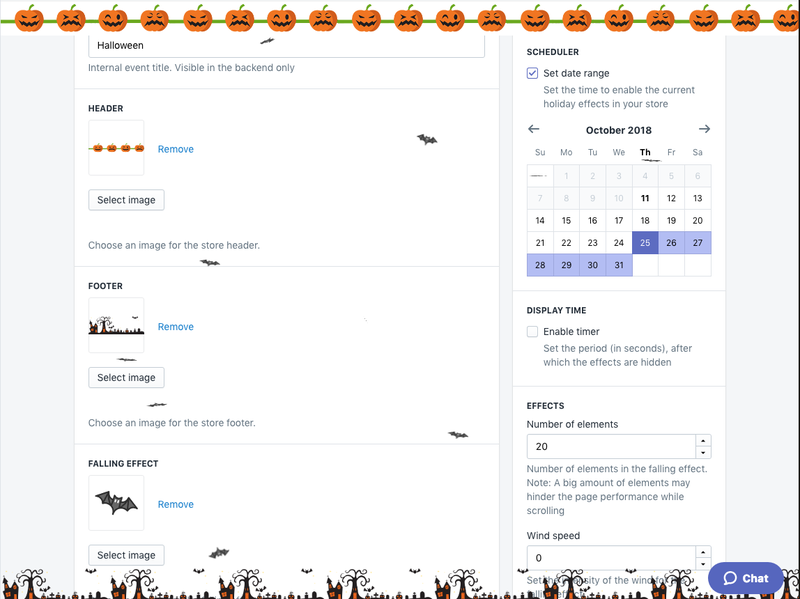 You can create а custom header and footer, falling decorations like stars, snowflakes or hearts and add a thematic cursor. With the Scheduler, you can add custom designs for any popular holiday, and set the time to apply them in your store. When the holiday time comes, the app will add the decorations automatically. 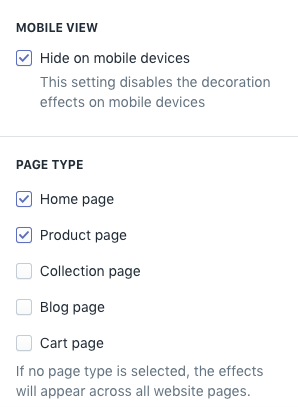 You can show the decorations on some particular pages (like home, product and collections pages), hide the design on the mobile devices and change the quantity and the direction of the falling objects. 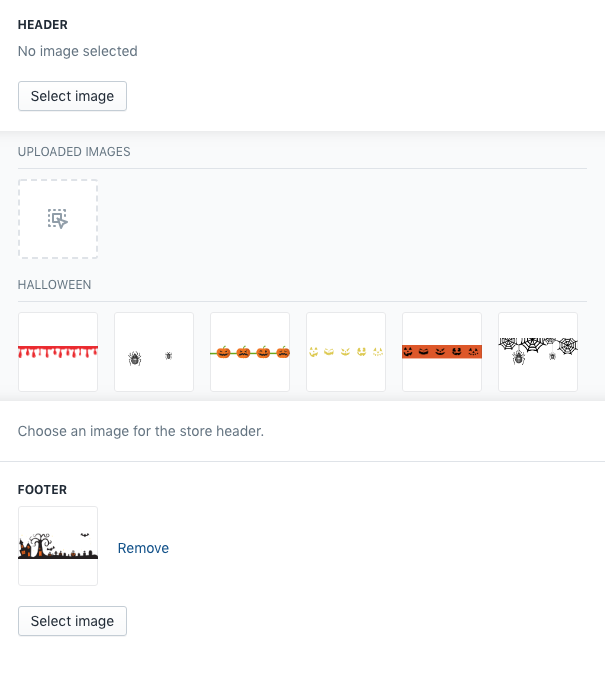 This screenshot shows the demo of the Halloween design on our store. To create, view, edit or delete the holiday events, please, go to Apps > Quick Holiday Effects. If the list is very long, you can easily filter all the events to find the one that you need. To create a new holiday event, click the Add Event button. When the event is added, it is set as disabled (hidden) by default. To show it on the frontend, click the Enable button. The Title is the name of the event. This name will be visible on the backend and will help to detect the correct one on the events grid. The Header, Footer, Falling Effect and Cursor sections provide the same logic: to add some image, click the Select Image button. 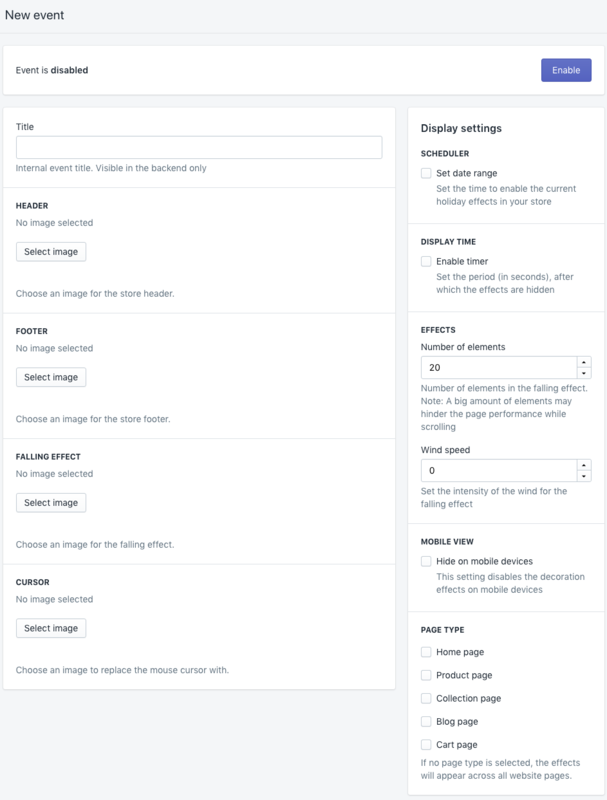 This workspace provides the list of the pre-defined images, separated by the holiday name. Above the list, you can click the square to upload your own image if you wish to create the unique design. Please note that the image should be less than 50 kB. If you decide to change the image, click the Remove link near the selected one. The Preview can be stopped by clicking the Close Preview button. To set the time for the Holidays effects to be active, select the required range on the Calendar. Please note that if the event starts in one month and ends in another, you shouldn't click the last day of the month when the event has started. Use the arrow keys instead and select the date to finish in another month. If the store owner, by chance or on purpose, has selected several events to be shown at the same time, it will show only one that was added later. The Number of Elements specifies the amount of falling objects that are shown at the same time. 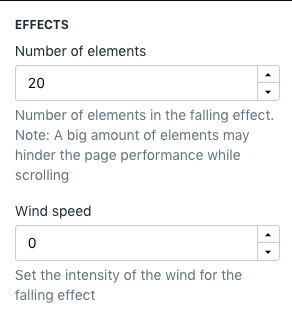 Not to mess up with the customer’s browsing experience, it’s recommended to set the amount of falling elements less then 20. The Wind Speed is the setting that determines the "drift" of the falling objects (like the wind blowing from the side). You can hide holiday design elements on the mobile devices. Most people prefer seeing only valuable information while browsing via smartphones so it may be better for the overall website satisfaction. The app allows hiding the holiday decorations on some specific page categories like only on the collection pages or home page. 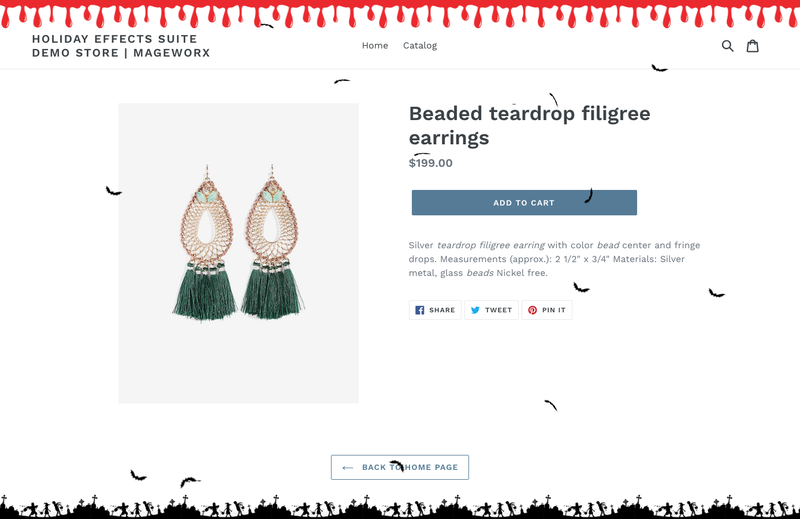 If no page type is selected, the effects will appear across all website pages.